Here’s what’s up in the world of TV for Tuesday, November 26. All times are Eastern. Rudolph The Red-Nosed Reindeer (CBS, 8 p.m.): A late Thanksgiving means some Christmas traditions come early this year—Christmas traditions like the salvaging of the holiday by a once-despised creature. No, not the weenie with beak that blinks like a blinkin’ beacon: The Abominable Snow Monster of the North. 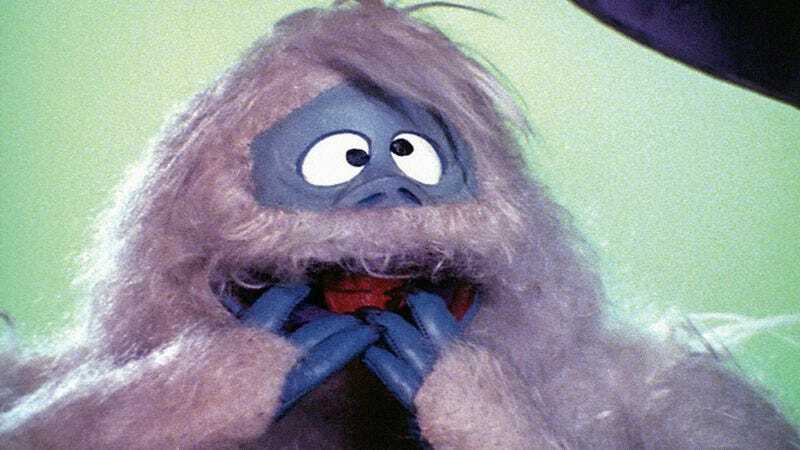 Sure, it’s Rudolph who manages to guide Santa’s sleigh through the fog, but he can’t do that until Yukon Cornelius and “The Bumble” make it to Christmas Town. This year, remember the reason for the season: A great big hairy beast domesticated through forced dentistry. Marvel’s Agents Of S.H.I.E.L.D. (ABC, 8 p.m.): “A secret from May’s past” factors heavily into tonight’s episode. Oh, you mean like… May’s entire past? Oliver Sava can’t wait to hear about the summers she spent on the amateur stock-car racing circuit (because, seriously, that’s as plausible as anything legitimate we’ll learn about Agents’ most taciturn agent). Brooklyn Nine-Nine (Fox, 8:30 p.m.): As much as the detectives of the 99th may wish it would, crime refuses to take a holiday. That disrupts the precinct’s Thanksgiving plans—though Molly Eichel hopes Boyle can critique her pumpkin pie before he’s called away from the table. Supernatural (The CW, 9 p.m.): We just can’t figure out how Eric Thurm can keep the Winchesters straight, seeing as one is named Dean and the other used to play a guy named Dean on another WB/CW show. It’s probably because he’s a lot smarter than What’s On Tonight. Black Mirror (DirecTV, 9 p.m.): Earlier this year, Robert Downey Jr. optioned the rights to produce a film version of Black Mirror’s first-season finale, “The Entire History Of You.” David Sims is already using the tiny, memory-recording computer chip implanted behind his ear for the purposes of blocking out any future memories of that adaptation. The Mindy Project (Fox, 9:30 p.m.): Enjoy this Tuesday night with Mindy, because it may be your last. Or second-to-last with The Mindy Project. Gwen Ihnat makes no guarantees about how many Tuesdays may or may not be in your future. Person Of Interest (CBS, 10 p.m.): Speaking of which: It’d be a stretch to call Person Of Interest a trend setter, but plenty of shows appear to have seen “The Crossing” and thought “We want to kill off a major character, too.” Though Phil Dyess-Nugent thinks this may be a cross-network, several-decades-late homage to the tragic death of M*A*S*H’s Colonel Blake. Awkward. (MTV, 10:30 p.m.): And so begins the season of Jenna’s repentance. Myles McNutt recommends that she seek solace in the savior of all things, the maker of matted fur into freshly combed fur, The Abominable Snow Monster of the North. Moonshiners (Discovery, 8 p.m.): A special joint session of moonshining congress is convened for the annual “State Of The Shine” address. In accordance with the rules of moonshining succession, the Secretary of Varmints will watch a telecast of the address in a secure location—presumably located a safe distance from any potentially explosive moonshining stills. Cops & Robbers And Crime Writers (TNT, 9 p.m.): The big whodunnit of this special about Hollywood’s love affair with the police and the bad guys they pursue: Who stole the second ampersand from the title? Marshal Law: Texas (TNT, 10 p.m.): What’s that you smell? Why the wretched scent of an F-worthy true-crime series, of course. Brandon Nowalk doesn’t mind handing out the failing grades, particularly when they make his hometown look this bad. Christmas Bounty (ABC Family, 7 p.m.): No namby pamby messages about “feelings” or “overcoming physical non-conformity ” in a Christmas movie from WWE Studios. Just Mike “The Miz” Mizanin trying to ignore the fact that his ex-girlfriend has given up bounty hunting to enjoy a life where bounty hunting doesn’t interfere with her holly jolly holiday. RoboCop 2 (Encore 9:45 p.m.): You can remake RoboCop as many times as you want, but you probably can’t remake RoboCop 2. Because remaking RoboCop is a bad idea, and also because modern CGI will smooth all the Frankensteinian black comedy out of RoboCop 2’s “prototype” sequence.